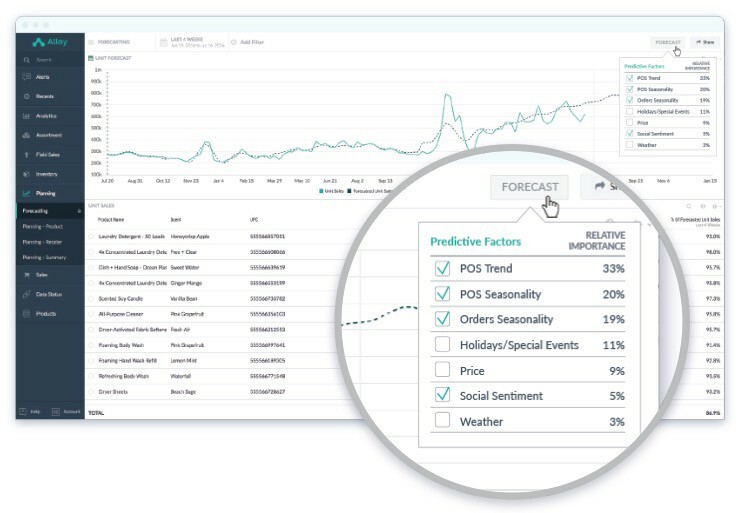 We’re thrilled to be starting off the year at Alloy on an exciting note by announcing the release of our new intelligent demand forecasting capability. Powered by the granular sales and inventory data gathered into our platform, this feature allows brands to continuously forecast demand using the most up-to-date and consumer-driven information available. Our customers have found it helps them more quickly respond to consumer demand — minimizing lost sales due to out-of-stocks, preventing losses from overstocks, improving overall customer service levels, and growing sales. Supporting demand forecasting fits right into our vision of empowering brands to become more demand-driven. From the beginning, our platform has helped aggregate and analyze data so that brands can gain better, faster insight into how their products are selling and where they need to be; now, we’ve added the next layer by using that data to fuel more timely and actionable demand forecasts. This integration enables us to provide critical input for daily business decisions while driving transparency and action that aligns sales and supply chain teams to take advantage of opportunities. We’re looking forward to further executing on our vision this year, extending the power of data-driven analysis through to demand planning, marketing promotions and events, and other critical areas. The start of a new year provides an opportunity to reflect on the previous 12 months, and I’m so proud to look back and see all our team has accomplished during that time, including continuing to build out our product. In May, we announced our Series A funding, which was a great validation of the work we’d done up to that point and a springboard for our forward progress. During the summer, we moved into new offices in San Francisco, Vancouver, and Berlin as our team continued to expand. Our company has doubled in size and gained new leaders like Rebecca Olson as Vice President of Sales. The supply chain community is a vast and robust presence in our industry, and we were honored to engage during the year with one of its key groups, APICS, for educational programs with both the Atlanta and Golden Gate chapters. Most importantly, we did all of this while effectively serving our existing customers and attracting new ones. Our client base grew 5x as we continued to demonstrate the value we provide to both traditional and digital-native brands! Our customers include outstanding companies on both ends of the spectrum, like Procter & Gamble, Facebook, Kano, DivaCup, and others. Looking at the 2019 retail landscape, there’s no denying that consumer goods brands will continue to face competitive disruption and increasing pressure from retailers and consumers. Data can be a real competitive advantage for savvy companies, but the challenge of collecting and analyzing all that data is daunting for teams trying to do it on their own — the data is siloed and increasing in volume, making it even harder to identify timely insights from it. With a solution like Alloy, organizations can efficiently use data to their advantage while focusing efforts on responding to demand, empowering front line decision-making with an intuitive, purpose-built platform and features like smart alerts. We see this shift from data wrangling to responding translate into tangible growth, with customers increasing product distribution, strengthening on shelf availability, improving sales, enhancing team productivity, and achieving other business goals. We’re excited to continue our momentum in the coming months and look forward to sharing additional updates with you. Be sure to follow our blog and LinkedIn for the latest news, as well as check out our recently updated website! If you want to learn more about our new demand forecasting feature, or about our platform overall, please don’t hesitate to send us a note at inquiries@alloy.ai.